So I stop on the way home to pick up dinner~7pm. I'm rolling up to the window and I hear the dash chime. Looking down I see the Check Gage's light on. So I scan and see the temp gage at 260. I could now smell the antifreeze and see the steam. I tell the girl at the window I need to move now so a let the clutch fly and Boom! It was like a bomb went off under the jeep. I felt it in the pedals and floorboards. The funny thing is !!!Boom!!! And Like a super zero, I roll off slowly from the cloud of steam. And the poor girl at the window had the poop scared out of her. The odd thing was there was no warning. Literally 30 sec between the chime and boom. I can't say I noticed the temp higher than normal lately. Nor can I say I looked at the gage on this ride until the chime went off. I thought of killing the engine immediately in the drive thru. But I figured I could get it into a parking spot quickly because it might not start back up. Was I wrong. Afterwards I had many offer help and were interested in what happened. I'm just glad the girl at the window wasn't hurt. Another funny is that radiator was clean. You don't often get to look down all the columns to see any buildup. I did today. So I guess it's time to take care of all the major and minor engine items. I rinsed off after toeing it home 9:30 and it's still hot. Anyone have a recommendation on what else should be checked or replaced while I have the radiator, fan and water pump out of the way? Last edited by JPNinPA; 06-09-2017 at 09:12 PM. Out of an abundance of caution check engine oil for coolant - easy quick. 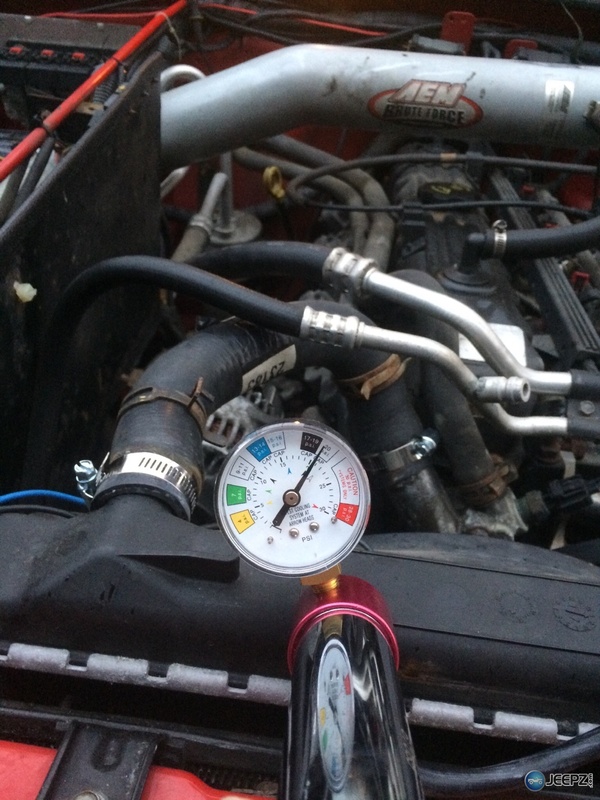 ADD radiator cap (pressure cap) to your list. To add maybe a trans cooler - But I think its a manual? Thanks I will add the rad cap. I tried to remove it today and it is shot. Never saw one like this. Good idea on the checks of the oil and pressure. I'm actually staying with OE radiator as it faired well. I'm thinking the thermo failed closed or the water pump failed. I have done the math and my homework. The radiator is like the sensors OEM is the best bet. It's ordered already and being shipped. Wow I've got one of those plastic radiators on 'BBB' I hope it doesn't blow like this! Last edited by Turbogus; 06-16-2017 at 09:15 AM. I've been traveling a lot over the month and finally got to replace parts. The water pump was fine but I replaced it anyway. The thermo is fine. So it looks like the pressure buildup was the radiator cap. The fluid on the expansion tank was the correct level and I had a hard time removing the cap. It also goes with what happened. No smell, steam or symptom prior to the rad exploding. Today I swapped out the tensioner. 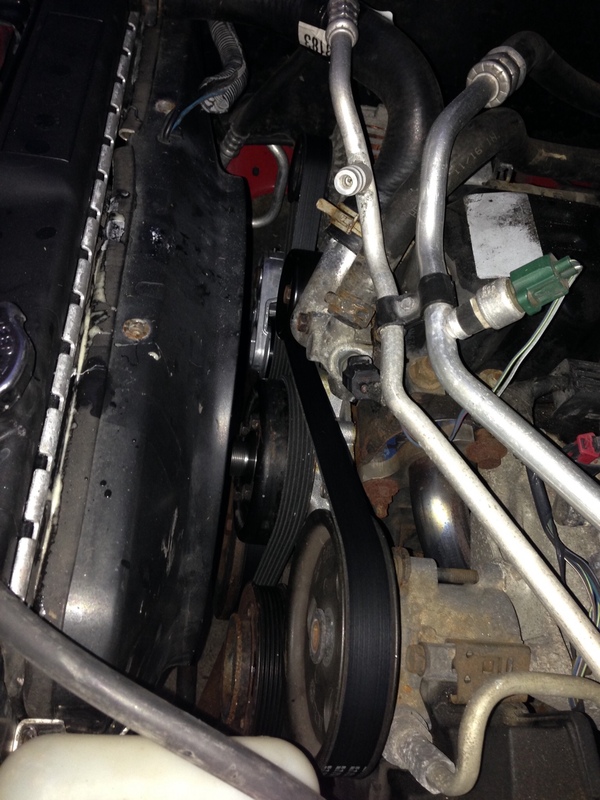 Idler pulley belt and hoses. The radiator is back in. Lastly the fan. All back together. Just need to change the oil now. Last edited by JPNinPA; 07-16-2017 at 06:47 AM. New update. Jeep sat over the winter. Battery dead but what seems to he a leak at the bottom hose to rad connection. Figured it out. Radiator test kit helped out a lot. Pumped it up to 17 psi and can hear the fluid dripping. 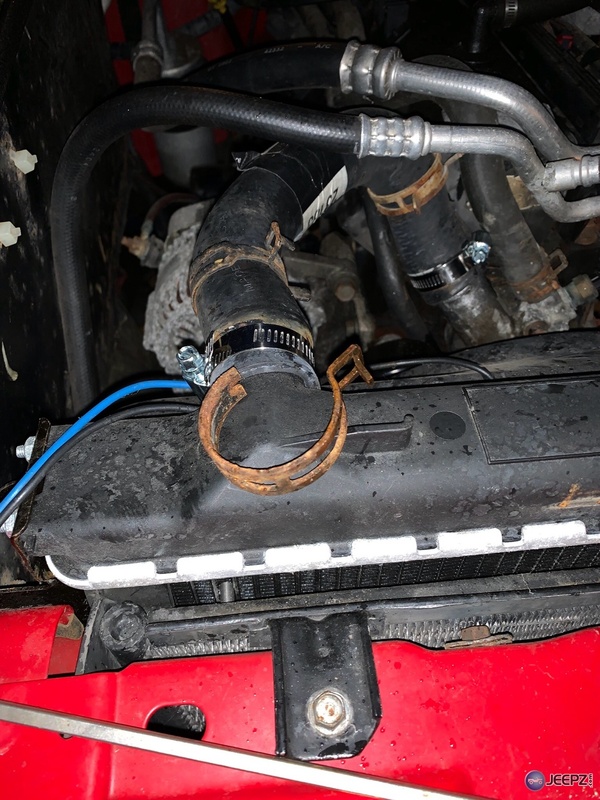 Look under and see the leak is fluid pushing past the hose clamp. So I get a set of pliers and gush! The lower clamp snapped with almost no effort. It seamed fine last I had it apart. Then I get four stainless clamps figuring if one is bad they all might be. Well good guess. If you look in the above pic you will see the top two with Stainless bands and the spring clips pulled back on the hose. The last one tackled was the one on the water pump and it was a bit larger and took a bit more effort but it's changed. Now it holds 18 psi for over 20 min. I didn't test any longer. If I didn't borrow the pressure tester I would be battling a fluid loss and overheat for a long time. The three other leaks would likely evaporate or boil off without notice. The pressure was going from 19 psi to just below 17 in 5 min then 10 min after the second and third clamp replacement respectively. Last edited by JPNinPA; 03-17-2019 at 09:49 PM. Glad you found and repaired it at home and not had the issue down the road somewhere! Yah thats the funny thing. Put a new battery in and new tires on it. Took it for a spin. noticed a puddle below the next morning but wasn’t sure because i topped it off the night before and thought that may have been a splash. Took it for another drive and decided to cut it short. Parked it and it really started leaking. So on a whim i avoided getting stuck on the road. So something is leaking. Took it out for an hour and there is another leak somewhere up front. Maybe i didn’t tighten a camp enough. It held 18 psi for a long time last night without moving. Maybe I had too much fluid in the overflow...IDK right now. I hope its not the water pump. It was the water pump. I don't know why the leaks at the hose clamps started after sitting. But once fixed the weep hole on the pump leaked. Ok still suffering a small leak. Found the lower rad hose is leaking. It sprays the bottom of the engine so you think the pump is still leaking. Looks like the 1.5 yr old hose needs replacing. The hose is bulged at the radiator and the new screw clamps may have cut the hose or the hose is just giving up bulge. 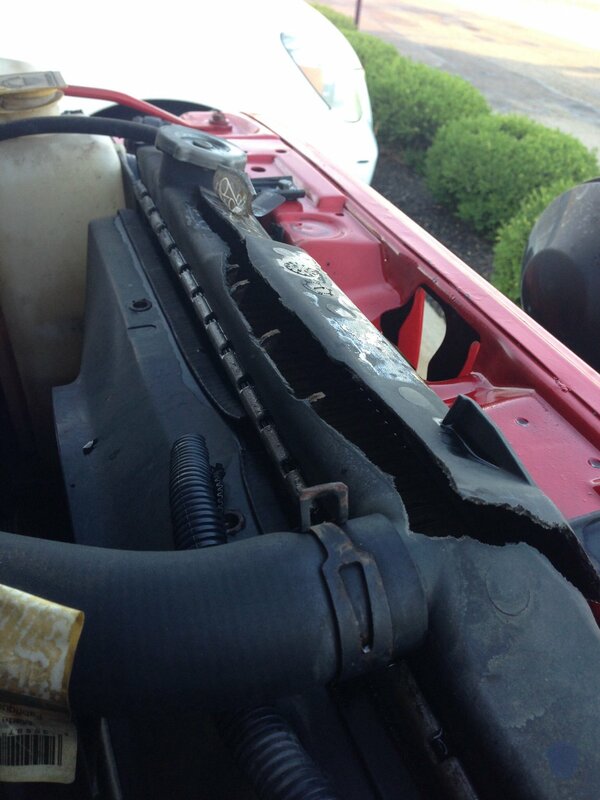 What brand hoses do you use? Currently gates but ey look thin. Plus I'm going back to spring clamps. Constant tension and will expand with heat. Stainless Screw clamps don't expand. OEM motor mount holes damaged, 01 TJ, will a bracket like bomb proof work?